With Credit Cards becoming ever so popular when it comes to making payments and using to avail various 0% finance schemes, one must be tempted to have a credit card. If you are planning to get a credit card for yourself; here are things to remember before getting a credit card in India. Credit cards or plastic money as they are popularly known have been around for quite some time now. However off late they have gained popularity due to the advent of online shopping, various tie-ins of companies giving offers on various purchases made by credit cards and the most popular zero % financing. As an individual, while it is all rosy and simple that you get a credit card, swipe it and get rewards as well as defer the payments to a later date, as you can pay now and settle the bill with the bank later; there are 6 things to consider before getting a credit card in India. First thing to consider is why you need the card. Is it for the offers it comes with, or is it for using it at every possible payment option so that you do not have to carry around cash, or is it simply to avail a onetime offer from retailer or online shopping, or is it just that you have an option in case you have to make some emergency payments and don’t have the cash in the bank? If you need a credit card that is just used in emergencies etc., then you should opt for a no frills card with low interest rates so that you are not tempted by any offers it comes with to keep using it just for the heck of it. If rewards is your motto, then check what kind of rewards it offers and do they suit you; like if you are a person using public transport, then a card giving you cash back on fuel refill is useless. Make the purpose clear and think twice before getting the card. Check the interest rates that are applicable on the card. If you plan to pay the credit dues on or before due dates than this shouldn’t matter to you but none the less, knowing the rates helps. Also if you plan on paying the minimum amount due on the credit card every month and then carry forward the balance (which is a bad habit though), then interest rates are the most important to you. Just like your interest rates, the annual fees of the card should be known and even when you have received a ‘free’ credit card, make sure that the annual fees do not kick in after the first or second year. The other factor is penalties for non payment or late payment. Apart from affecting your credit score, it will also rip your pockets as the late payment charges clubbed with the interest can be quiet a handful, plus the principal amount will also be due. Make sure you know all the charges upfront and do not be surprised when the bill arrives. If you intend to use the card for every purchase, you would need a high credit limit however if you are a casual user who intends to use the card once in a while you can opt for a lower credit limit too. This is something you should think and remember before getting a credit card in India. If you plan to keep it handy in case of emergencies the credit limit is something that will be important. Obviously the credit limit also depends on your credit profile and income and other factors analyzed by your credit card provider. If your sole purpose of getting a credit card is to avail the various discounts and offers make sure you choose a card that has relevant offers for you. For instance if you are a movie buff and get a card that has frequent flier points than it is no use to you if you do not fly often. So read the fine print and analyze the card before getting one. Also if you are only opting to get credit card to get some discount and offer on one time purchase, then think again. Do you really want the card or can arrange to make the payment and get the offer from a friend or family member’s card and pay them later. Also make sure you are aware of the catch behind various zero % schemes before thinking of opting for a card. Even before you opt for a card or think of getting a credit card, put it deep down in your psyche that you will pay up on time and not default. While you can settle the thing with your bank, it will reflect badly on your credit score at Credit Information Bureau India Limited or CIBIL. This will in turn affect your chances of getting a loan in the future for more serious matters like home loans etc and that can mean a higher interest rate or lower loan amount. That sure can pinch you. 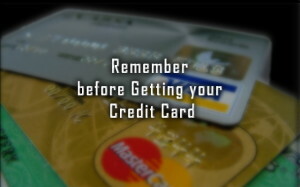 So while opting for a credit card, keep this in mind. Remember, Credit card is not free money or something to flash and flaunt around. It is a facility that the banks provide you to be able to pay when you do not have the cash. But this tool can very easily become a bank’s biggest earning factor from you if you default or are ignorant about the above mentioned things to consider while getting credit cards in India. So be aware and careful when dealing with the matters of money, especially plastic money.